It is a fairly common facial rash which usually affects the skin surrounding the mouth and out towards the cheeks. The rash can also sometimes occur on the forehead and around the eyes but this is less common. The vast majority of those affected are women from the age of 16 to 45 and it very rarely affects men or children. Although the exact causes of the condition are not fully known, perioral dermatitis is more common in those who suffer other forms of dermatitis. The rash starts as a reddening of the skin, which may degenerate into small puss filled lumps. The skin may also become scaly and peel off. The area surrounding the mouth is most commonly affected with the skin directly surrounding the lips remaining unscathed. The rash itself resembles acne for which it is often mistaken and typically causes a burning sensation. While the cause is unknown, there is a strong link between the condition and the prolonged use of steroid creams. These creams are often prescribed to treat other forms of dermatitis and is a probable cause of perioral dermatitis being seen in those who suffer from other forms of the complaint. Perioral dermatitis may also be linked to the use of cosmetic products as well as certain dental products containing fluoride. Once diagnosed, the usual medical advice is to stop using all steroidal creams as well as facial creams and cosmetics. Sometimes topical and oral antibiotics are prescribed. As well as discontinuing the use of steroid creams and certain cosmetic products, there are natural treatment options that you might find helpful. Many people have had success with a variety of natural remedies but everybody’s skin reacts differently and there are no guarantees. 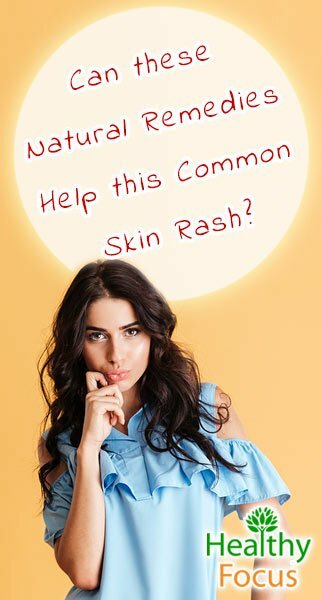 If you find that any of these remedies make your rash worse, then you should stop using them immediately but with a little trial and error, you might find the most effective treatment for your condition. There is little doubt by now that apple cider vinegar is good for you. It is commonly used to promote overall health but is also used to treat skin conditions like acne and many people have found it an effective natural treatment for perioral dermatitis. It is so beneficial for the skin because it contains malic acid and other essential minerals and vitamins which help nourish and rejuvenate the skin. It also contains anti-inflammatory properties and antibacterial properties that soothe the skin and eliminate infection. First dilute your apple cider vinegar with water to a ratio of around 1 part vinegar to 3 parts water. Moisten a cotton ball with your mixture and apply it to the affected area twice a day. For general health and skin care purposes, try drinking a tablespoon of apple cider vinegar at least once a day, you can mix it with honey if the taste is too strong. Grapefruit seed extract has been used as an effective remedy for many sufferers of perioral dermatitis. It acts as an excellent cleanser which removes bacteria and other toxins from the skin. Grapefruit seed extract has antibacterial properties that help treat any skin infections from within. Add 5 drops of grapefruit seed extract to a tablespoon of water and mix it up well. Apply the mixture to your rash with a cotton pad or cotton ball several times a day. Some people say that it causes a temporary itching sensation after being applied but this is nothing to worry about. Aloe vera gel is a well-known remedy for many types of skin complaint and it has been used with great effect by some people trying to get their perioral dermatitis under control naturally. Aloe vera has natural anti-inflammatory and antimicrobial properties which help soothe redness and calm itching. You can use either a store bought gel (cold pressed is preferred) or directly from the plant. If you have the plant, cut a fresh aloe vera leaf lengthways and extract the gel. Apply the gel to the affected areas of your face twice a day for as long as you need. Evening primrose oil is taken by many people to treat a variety of skin complaints including perioral dermatitis. Testimonial evidence is mixed but a number of people find it to be an effective supplement to use in combination with other treatments. There is some evidence that evening primrose oil can help soothe itching and inflamed skin when used regularly though how it works exactly is unclear. Primrose is rich in essential fatty acids (EFAs) and specifically gamma linolenic acid (GLA)—both of which are great for general skin health. If your diet is lacking EFAs and GLA then Primrose would likely be helpful. Evening primrose is available in capsule and oil form and should be taken with your meal. Natural yogurt has also proved to be an effective remedy for some people suffering with perioral dermatitis. When applied to the face, it helps reduce any irritation and cool down the skin. You can either apply your natural yogurt to your rash alone or add a few drops of apple cider vinegar and green tea to make a very effective face mask. Try this remedy at least twice a day for a few weeks to see if it helps your symptoms. Like most of these remedies, there are mixed reports regarding coconut oil’s ability to treat perioral dermatitis. Many women have found it to be extremely effective while others report no effect and some suggesting that it made their condition worse. Virgin coconut oil is used for a number of skin conditions like eczema and psoriasis because it contains beneficial lauric acids as well as antimicrobial properties. Virgin coconut oil is an excellent moisturizer which helps reduce dryness and scaling caused by perioral dermatitis. Warm up your coconut oil in the microwave and apply it to the affected areas several times a day. If you find that your condition is deteriorating, stop using it immediately but with any luck it will be a significant benefit to your skin. Calendula is generally well tolerated and contains antibacterial, antifungal and moisturizing qualities. It is certainly worth trying calendula cream because many people have had success and because of its ability to soothe the irritation and inflammation associated with the condition. Vitamin E promotes skin healing while relieving the inflammation and itchiness caused by perioral dermatitis. You can either apply vitamin E oil directly to the affected areas or buy one of the many Vitamin E based lotions and creams. It sounds strange but slathering your face in sticky honey can really help fight inflammation. Honey also has potent antibacterial and antiseptic qualities making it a powerful ally against various skin complaints. Certain honeys like manuka honey are especially effective although you can expect them to cost quite a bit more. Manuka honey has actually been found effective in treating dermatitis caused by radiation therapy though there is no research regarding its ability to treat perioral dermatitis. Turmeric is an herb with excellent healing properties. Turmeric is a powerful anti-inflammatory that can be used to great effect against a variety of skin conditions. Try mixing your turmeric powder into a smooth paste by adding it to some distilled water or natural yogurt. Apply the finished paste to the affected area twice a day and you will hopefully start to see some positive results. 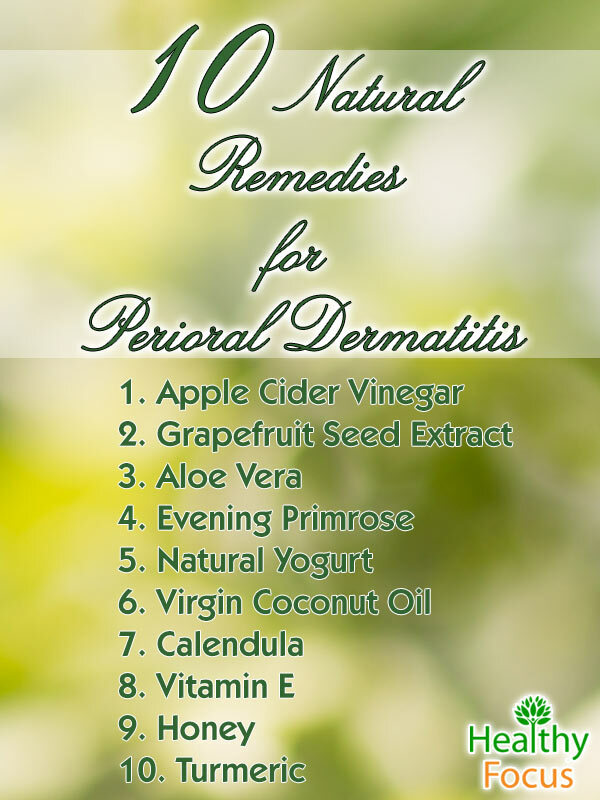 Hopefully one of these natural remedies or several used in combination will help you to control your perioral dermatitis. It is vitally important however that you stop using anything that may be causing your outbreaks. Make sure that you do not apply any steroidal creams or any cosmetic creams and lotions that may be a contributory factor. Eliminate any fluoride based dental products and be careful with make your use of makeup. With a little trial and error, you will hopefully get your condition under complete control. Good luck.